Solution of the three-dimensional (3D) structure of Torpedo californica acetylcholinesterase (TcAChE) in 1991  opened up new horizons in research on an enzyme that had already been the subject of intensive investigation. The unanticipated structure of this extremely rapid enzyme, in which the active site was found to be buried at the bottom of a , lined by (colored dark magenta), led to a revision of the views then held concerning substrate traffic, recognition and hydrolysis . This led to a series of theoretical and experimental studies, which took advantage of recent advances in theoretical techniques for treatment of proteins, such as molecular dynamics and electrostatics and to site-directed mutagenesis, utilizing suitable expression systems. Acetylcholinesterase hydrolysizes the neurotransmitter acetylcholine , producing group. ACh directly binds (via its nucleophilic Oγ atom) within the (ACh/TcAChE structure 2ace). The residues are also important in the ligand recognition . After this binding acetylcholinesterase ACh. Organophosphorus (OP) acid anhydride nerve agents are potent inhibitors which rapidly phosphonylate AChE and then may undergo an internal dealkylation reaction (called "aging") to produce an OP-enzyme conjugate that cannot be reactivated. Reaction between Ser200Oγ and Soman, assuming an in-line attack by the Oγ, followed by spontaneous dealkylation of the O-pinacolyl group. As was mentioned above, AChE hydrolysizes the neurotransmitter , producing group. directly binds catalytic (via its nucleophilic Oγ atom). , O-(1,2,2-trimethylpropyl) methylphosphonofluoridate (fluorine atom is colored violet and phosphorus atom is colored darkmagenta), is one of the most toxic OPs. Soman inhibits AChE by to catalytic Ser200, . This process implicates nucleophilic attack of the Ser200 nucleophilic Oγ atom on the phosphorus atom of soman, with concomitant departure of its fluoride atom. After that AChE catalyzes the of the soman or other OP. This causes irreversible inhibition of AChE, "aged" soman/AChE conjugate can not be reactivated. However, before “aging”, at the step of , AChE can be by nucleophiles, such as pralidoxime (2-PAM), resulting in of the phosphonyl adduct from Ser200 Oγ. At the (2wfz) the catalytic His440 forms hydrogen bonds with Ser200 Oγ and Glu327 Oε1 via its Nε2 and Nδ1 nitrogens, respectively. The O2 atom of soman is within hydrogen bonding distance of His440 Nε2. Soman O1 mimicks carbonyl oxygen of ACh. A water molecule 1001 interacting with soman O2 is represented as a red ball. The active site residues of the nonaged soman/TcAChE are colored yellow. The O2 atom of the (2wg0) forms a salt bridge with His440 Nε2. The active site residues of the aged soman/TcAChE are colored pink. of the structures of the nonaged (2wfz) and aged (2wg0) conjugates reveals a small, but important, change within the active site - the imidazole ring of His440 is tilted back to a native-like conformation after dealkylation. The water molecule 1001, which interacts with soman O2 in the nonaged crystal structure, is not within hydrogen bonding distance of O2 in the aged crystal structure. 2-PAM binds poorly to the nonaged phosphonylated enzyme (its electron density was not found) and binds in an after soman aging to TcAChE (2wg1) . To understand the basis for irreversible inhibition, the obtained by reaction of TcAChE with soman was solved by X-ray crystallography to 2.2Å resolution (1som). The highest positive difference density peak corresponded to the OP phosphorus and was located within covalent bonding distance of the active-site serine (S200). The are within hydrogen-bonding distance of four potential donors from catalytic subsites of the enzyme, suggesting that electrostatic forces significantly stabilize the aged enzyme. The methyl group of soman occupies the , bounded by Trp233, Phe288, and Phe290 . Sarin, O-isopropylmethylphosponofluoridate, is an other toxic OP compound. It is also inhibits AChE by covalent binding to the catalytic Ser200. The active sites of aged (1cfj) and aged soman-TcAChE (1som and 2wg0) are almost identical and provided structural models for the negatively charged, tetrahedral intermediate that occurs during deacylation with the ACh. There are four hydrogen bond donors (red dotted lines) to the anionic phosphonyl oxygen atoms: the backbone amide nitrogen atoms of Ala201, Gly118, and Gly119, as well as His440 Nε2. The sarin methyl carbon (colored cyan) is within non-bonded contact distances (black dotted lines) of Phe288 and Phe290 in the acyl binding pocket . , diisopropylphosphorofluoridate, is an other toxic OP nerve agent. It is also inhibits AChE by covalent binding to the catalytic Ser200. As in the case with soman (1som) and sarin (1cfj), there are four hydrogen bond donors (dotted lines) to the anionic phosphonyl oxygen atoms: the backbone amide nitrogen atoms of Ala201, Gly118, and Gly119, as well as His440 Nε2 at the of aged DFP-TcAChE (2dfp). Phosphorylation with DFP caused an unexpected distortion in the main chain of a loop that includes residues F288 and F290 of the TcAChE acyl binding pocket. F288 and F290 move significantly in the DFP-TcAChE structure (green), in comparison to their positions in the native enzyme (2ace). This is the first major conformational change reported in the active site of any AChE−ligand complex, and it offers a structural explanation for the substrate selectivity of AChE . Alzheimer's disease (AD) is a disorder that attacks the central nervous system through progressive degeneration of its neurons. Patients with this disease develop dementia which becomes more severe as the disease progresses. It was suggested that symptoms of AD are caused by decrease of activity of cholinergic neocortical and hippocampal neurons. Treatment of AD by ACh precursors and cholinergic agonists was ineffective or caused severe side effects. ACh hydrolysis by AChE causes termination of cholinergic neurotransmission. Therefore, compounds which inhibit AChE might significantly increase the levels of ACh depleted in AD. Indeed, it was shown that AChE inhibitors improve the cognitive abilities of AD patients at early stages of the disease development. The first generation of AD drugs were AChE inhibitors: alcaloids like (-)-Huperzine A (HupA) and (-)-galanthamine (GAL, Reminyl); synthetic compounds tacrine (Cognex) and rivastigmine (Exelon). 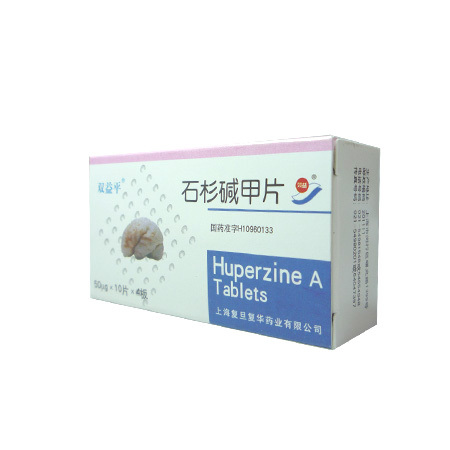 (-)-Huperzine A, discovered by Chinese scientists from 1980s, has been proved to be a powerful, highly specific, and reversible inhibitor of AChE. It is a novel alkaloid originally isolated from the Traditional Chinese medicine  Qian Ceng Ta which is produced from the whole plant of the firmossHuperzia serrata. Qian Ceng Ta has been used for over 1000 years in China for treatment of contusions, strains, swellings, schizophrenia and myasthenia gravis. Shuangyiping, a tablet form of HupA produced from the extracts of Huperzia serrata, was developed in 1996 as a new drug for symptomatic treatment of Alzheimer’s disease in China. Compared with the other three FDA-approved drugs for the treatment of Alzheimer’s disease, Donepezil (Aricept), Rivastigmine (Exelon), Galanthamine (Reminyl), HupA has better penetration through the blood-brain barrier, higher oral bioavailability, and longer duration of AChE inhibitory action. The structure of HupA shows some similarity to other known AChE inhibitors. The molecule is fairly rigid and contains an aromatic system as well as a primary amino group that is probably protonated at physiological pH. Various suggestions have been made with respect to its orientation within the active site of AChE, and with respect to the amino acid residue with which its putative pharmacophoric groups might interact. Solution of the 3D structure of a complex of HupA with AChE would permit unequivocal resolution of this issue and it would also provide a rational basis for structure-related drug design aimed at developing synthetic analogues of HupA with improved therapeutic properties. The crystal structure of the complex of TcAChE with HupA at 2.5 Å resolution (1vot) was determined in 1997 and it shows an unexpected orientation for the inhibitor with surprisingly few strong direct interactions with protein residues to explain its high affinity. HupA binds to TcAChE at the active site, and its in comparison to ACh. The principal interactions of are including: a direct (colored orange) through a water molecule as a linker at the bottom of the gorge; cation-π interactions between the amino group of (colored green) with the distance between the nitrogen and the centroid of the aromatic rings of 4.8 and 4.7 Å, respectively; at the top of the gorge, hydrogen bonds through two water molecules as linkers formed between the amino group of (colored magenta). An unusually short (~3.0 Å) C-H→O HB has been seen between the ethylidene methyl group of (colored crimson) .
. In the X-ray crystal structure of TcAChE/ complex which was determined at 2.8 Å resolution, the tacrine is seen (magenta) bound in the active site of TcAChE (1acj) . ACh (gray) is shown for comparison. In the crystal structure of Torpedo californica acetylcholinesterase (TcAChE) complexed with tacrine (THA), THA's acridine ring is stacked between the aromatic rings of , near the catalytic triad of which consists of S200, E327, H440. When comparing 3 recent complexes of TcAChE, i.e. edrophonium (EDR), decamethonium (DECA) and THA, the only major conformational difference between them is seen in the orientation of the phenyl ring of F330. In the DECA complex it lies parallel to the surface of the gorge; in the other two complexes it is positioned to make contact with the bound ligand. This close interaction was confirmed by photoaffinity labeling by a 3H-labeled photosensitive probe, which labeled, predominantly, F330 within the active site. Labeling of was also observed. One mole of label is incorporated per mole of AChE inactivated, indicating that labeling of W279 and that of F330 are mutually exclusive. The structural and chemical data, together, show the important role of aromatic groups as binding sites for quaternary ligands, and they provide complementary evidence assigning W84 and F330 to the "anionic" subsite of the active site and W279 to the "peripheral" anionic site. (HUPerzine A + tacRINE) is one of the most potent reversible AChE inhibitors. This consists of a carbobicyclic moiety resembling that of (−)- (colored blueviolet) and the 4-aminoquinoline substructure of (colored magenta). Both these compounds are known AChE inhibitors. (−)-Huperzine A and tacrine positions partially overlap each other at the TcAChE . TcAChE residues interacting with (−)-huperzine A (1vot) are colored orange and with tacrine (1acj) are colored cyan. The of the 4-aminoquinoline substructure of the huprine X in its complex with TcAChE (1e66, TcAChE interacting residues are in green) is very similar to that of tacrine. The ring system of (−)-huperzine A is almost 180° relative to that of huprine X .
. (red) is an alkaloid from the flower snowdrop (Galanthus nivalis). The X-ray crystal structure of the TcAChE/GAL complex (1dx6) was determined at 2.3 Å resolution. The inhibitor binds at the base of the active site gorge of TcAChE, interacting with both the choline-binding site (Trp84) and the acyl-binding pocket (Phe288, Phe290). The tertiary amine appears to make a non-conventional hydrogen bond, via its N-methyl group, to Asp72. The hydroxyl group of the inhibitor makes a strong hydrogen bond (2.7 Å) with Glu199 . ACh (gray) is shown for comparison. is stacked between the aromatic rings of , near the TcAChE which consists of S200, E327, and H440 (2ack or 1ax9) . The X-ray structure of TcAChE in complex with galanthamine iminium derivative (compound 5) was determined at 2.05 Å resolution (1w6r). The of this compound (cyan) with TcAChE is virtually identical to that of galanthamine (red) itself (1dx6). The TcAChE residues which interact with galanthamine in the galanthamine/TcAChE complex are colored pink, while those of compound 5/TcAChE are in lime. The main structural change is the side-chain movement of Phe330 in compound 5/TcAChE complex, in comparison to that of galanthamine. Compound 5 differs from galanthamine by the presence of (N+; blue) instead N of galanthamine. This chemical difference causes the structural change in TcAChE and the slight decrease in affinity of compound 5 to TcAChE in comparison to galanthamine . Rivastigmine (Exelon) is a carbamate inhibitor of AChE, and it is currenly used in therapy of Alzheimer's disease. Rivastigmine (Exelon) (colored yellow) interacts with TcAChE (colored lime) at the (1gqr). The carbamyl moiety of rivastigmine is to the active-site S200 Oγ. The second part of rivastigmine (the leaving group), NAP ((−)-S-3-[1-(dimethylamino)ethyl]phenol) is also held in the active-site gorge, but it is from the carbamyl moiety, hence, carbamylation took place. The of TcAChE/NAP (colored magenta) is known (1gqs). The TcAChE active-site residues which are interacting with NAP are colored violet. NAP is located in a similar region of TcAChE active site, but with different orientation than that of the NAP part (colored yellow) in the TcAChE/rivastigmine complex. Only H440 and F330 significantly change their side-chain conformations. of the TcAChE active sites in 4 different structures (TcAChE/rivastigmine (1gqr), TcAChE/NAP (1gqs), native TcAChE (2ace), and TcAChE/VX (1vxr, TcAChE colored white and VX black) reveals that the conformation of H440 in the TcAChE/NAP structure is very similar its conformation in the native TcAChE (2ace), but the distance between H440 Nδ and E327 Oε is significantly longer in the TcAChE/rivastigmine and the TcAChE/VX complexes. This structural change disrupts the catalytic triad consisting of S200, E327, H440. This could explain the very slow kinetics of AChE reactivation after its inhibition by rivastigmine . The TcAChE active site consists of two binding subsites. One of them is the "catalytic anionic site" (CAS), which involves the catalytic triad (colored orange) and the conserved residues which also participate in ligand recognition. Another conserved residue (colored cyan) is situated at the second binding subsite, termed the "peripheral anionic site" (PAS), ~14 Å from CAS. is a good example of the PAS-binding AChE inhibitors. of the crystal structure of the edrophonium/TcAChE (mentioned above as a CAS-binding inhibitor) (2ack) on the thioflavin T/TcAChE complex structure (2j3q) shows that these ligands' positions do not overlap. Of note is that Phe330, which is part of the CAS, is the single residue interacting with thioflavin T. This residue is the only one which significantly to avoid clashes in comparison to other CAS residues of the edrophonium/TcAChE complex  . OTMA is a nonhydrolyzable substrate analogue of AChE. Its hydrolysis is impossible as possesses atom instead of the in the AChE natural substrate ACh. Similarly to ACh, OTMA covalently binds to the TcAChE (2vja) Oγ at the CAS. At this subsite OTMA also interacts with (cation-π interactions); (electrostatic interaction); (hydrogen bonds). OTMA binds not only at CAS, but also at PAS. A second OTMA molecule interacts with (cation-π interactions), and (weak hydrogen bond) . Thus, this dual binding mode of OTMA with TcAChE (to CAS and PAS) could be prototypical for AChE bivalent inhibitors. The of TcAChE consists of two binding subsites. First of them is the "catalytic anionic site" (CAS), which involves mentioned above catalytic triad (colored orange) and the conserved residues and also participating in ligands recognition. Another conserved residue (colored cyan) is situated at the second binding subsite, termed the "peripheral anionic site" (PAS), ~14 Å from CAS. Therefore, the ligands that will be able to interact with both these subsites, will be more potent AChE inhibitors in comparison to compounds interacting only with CAS. One of the ways to produce such ligands is to introduce two active substances into one compound. If it is spatially necessary these subunits could be divided by alkyl linker with suitable length. According to the strategy of the use of a bivalent ligand, the (RS)-(±)-tacrine-(10)-hupyridone ((R)-3 or (S)-3) was designed and synthesized. It consists of mentioned in the page 'AChE inhibitors and substrates' (colored magenta), 10-carbon (yellow), and (red). The tacrine moiety of this inhibitor binds at the CAS, the linker spans the gorge, and the hupyridone moiety binds at the PAS. The comparison of the (R)-3/TcAChE and tacrine/TcAChE complexes at the . A of the trigonal (R)-3/TcAChE structure (1zgb; (R)-3 colored cyan; TcAChE residues interacting with (R)-3 are colored sea-green) with the crystal structure of tacrine/TcAChE (1acj, tacrine colored magenta; residues interacting with tacrine are colored pink) reveals a similar binding mode for the tacrine moiety. In both structures the tacrine ring is situated at the CAS, between the aromatic residues Trp84 and Phe330. Steric clash with the 10-carbon linker could explain the tilt observed for the Phe330 (yellow and transparent in the tacrine/TcAChE). Water molecules are shown as red spheres. The tacrine unit of (R)-3 N forms with His440 O (3.0 Å) similar to that of tacrine alone. Similarly to the tacrine/TcAChE structure the system of three water molecules at the CAS ((R)-3/TcAChE) binds the tacrine-linker N via hydrogen bonds to Ser81 O, Ser122 Oγ, and Asn85 Oδ1 (2.6-3.5 Å). The of (R)-3 (cyan) and (S)-3 (1zgc) bound to the TcAChE active site in the orthorhombic forms is shown. of (S,S)-(-)-4a (magenta) and (S)-3 (orange, orthorhombic TcAChE) demonstrates the similar mode of binding of the hupyridone unit at the PAS. The residues Trp279 (top) and Trp84 (bottom) represent the PAS and the CAS, respectively . The comparison of the (R)-3/TcAChE (1zgb) and bis-hupyridone/TcAChE complexes (1h22 and 1h23) at the . of the (R)-tacrine-(10)-hupyridone ((R)-3, cyan) and (S,S)-(-)-Bis(12)-hupyridone ((S,S)-(-)-4b, orange, i.e. 12-carbon-tether-linked hupyridone dimer) and (S,S)-(-)-Bis(10)-hupyridone ((S,S)-(-)-4a, plum) complexes demonstrates the binding mode of the hupyridone moiety. TcAChE residues of symmetry-related molecule are shown in magenta. X-ray structures of TcAChE complexed with these 10- and 12-carbon-tether-linked 2 (S,S)-(-)-4a and (S,S)-(-)-4b show one subunit bound at the , the linker spanning the gorge, and the other subunit bound at the . There are two connecting the hupyridone O to Lys11 Nζ and hupyridone N to Gln185 Oε1 of a symmetry-related molecule at (R)-3/TcAChE complex. Water molecules are shown as red spheres. Another hydrogen bond connects the hupyridone O to a water molecule, which is bound to Ser286 N. Similarly, the hupyridone-PAS unit of both (-)-4a and (-)-4b forms direct and an indirect hydrogen bonds with the protein backbone in the PAS region  . 2d and 2f are bis(n)-tacrine derivatives with n=5 and 7 (number of carbons in the linkers), respectively. These compounds are more potent and selective AChE inhibitors than tacrine alone. The binding of the tacrine moiety of at the TcAChE catalytic anionic site (CAS) is similar to that of tacrine in the tacrine/TcAChE complex (1acj). The second tacrine moiety of the 2d interacts with the peripheral anionic site (PAS) near Trp279. The interaction of 2d at the CAS causes an increase of the between Ser200 Oγ and H440 Nε2 atoms, and, therefore, disruption of the catalytic triad (Ser200, H220, E327) as seen in the native structure (2ace). The binding of 2d results in in the Val281-Ser291 loop changing the surface of the active-site gorge from its native conformation (2ace). The tacrine moiety of the compound 2f (heptylene-linked bis-tacrine at the CAS, 2ckm) adopts similar as tacrine in the tacrine/TcAChE complex and the tacrine moiety of the 2d at the CAS. The second tacrine moiety of the 2f interacts with PAS near the Trp279, like 2d. The of 2f does not cause significant structural changes in TcAChE from its native structure. of the structures of 2d/TcAChE and 2f/TcAChE reveals different contacts between the tacrine moieties of these compounds at the PAS and TcAChE. There are two additional structures of tacrine-containing TcAChE complexes: compounds (1ut6) and (1odc). The tacrine moieties of these compounds adopt similar conformations and interactions with CAS as the tacrine in the tacrine/TcAChE, 2f/TcAChE and 2d/TcAChE. Inhibitors 6 and 7 are spanning the between the CAS and the PAS, but since compound 7 lacks the second tacrine moiety, Trp279 adopts a different conformation in this complex structure. In the three structures: native TcAChE (cyan), cmp 6/TcAChE complex (white), and cmp 7/TcAChE complex (crimson) , all the TcAChE active-site gorge residues have identical conformation except Trp279   . Described in the page 'AChE inhibitors and substrates (Part II)' galanthamine (; colored red) is an AChE inhibitor and it is currently used in therapy of the Alzheimer's disease (AD). Conjugate of GAL through the (8 carbons, yellow) with a (blueviolet) called compound 3 has a larger affinity for AChE than that of GAL alone. This is similar to previously described cases of bivalent ligands. A comparison between /TcAChE (1w4l) and structure (1dx6) shows an identical binding mode of the GAL-moiety (transparent red) of compound 3 to that of GAL alone (blue) at the CAS. A PEG molecule (gray) is located at the active site of the galanthamine/TcAChE structure. The alkyl linker spans the active-site gorge and the phthalimido moiety of compound 3 is situated near Trp279 at the PAS. Compound 3 has higher affinity to TcAChE than GAL. This can be explained by the higher number of interactions between compound 3 (which interacts not only with residues within CAS but also within PAS) and TcAChE relative to GAL . The drug (yellow) interacts with 13 residues of the from Trp84 at the bottom to Phe284 at the top (1u65). Nine of these residues are (Tyr70, Trp84, Tyr121, Trp279, Phe284, Phe330, Phe331, Tyr334, and His440; colored dark magenta). The contacts made by the drug at the bottom of the gorge involves with Trp84, Tyr121, Phe331, and His440 and, especially, a stacking interaction with Phe330. The carbamate moiety of CPT-11 is seen near residues . Carbon C9 (shown in magenta) of the carbamate linkage in CPT-11, is 9.3 Å from Oγ, the nucleophilic atom within the three catalytic residues Ser200, His440, and Glu327. The steric clashes between CPT-11 and TcAChE residues bar the positioning of CPT-11 near Ser200 Oγ (where hydrolysis could occur), therefore, TcAChE can not hydrolyze CPT-11 . In a similar fashion to other AChE bivalent inhibitors, BW284C51 (BW) binds to TcAChE (1e3q) at both subsites of its - CAS and PAS. At the CAS, the BW makes a cation-aromatic interaction via its quaternary group to (colored orange). The BW phenyl ring forms an aromatic-aromatic interaction with His440. There is also an electrostatic interaction between the BW proximal quaternary group and Glu199. Near the PAS, BW via its distal quaternary group, interacts with (colored cyan) and forms an aromatic interaction with Tyr334. BW forms hydrogen bond with Tyr121 OH, and makes alkyl interactions with Phe331. The superposition of BW with two other AChE bivalent inhibitors (decamethonium, colored gray, 1acl) and (Aricept, colored blueviolet, 1eve) at the TcAChE active site gorge reveals similar mode of binding. These 3 inhibitors form cation-π and π-π interactions with active-site gorge aromatic residues (colored yellow). The superposition of reveals their similar trajectory along the active site gorge, but has a different one. This results in , which interacts with BW more strongly than with DECA and E2020. The conformations of the other important residues at the active site are similar in all these inhibitor complexes. It has been shown experimentally that BW and E2020 bind to TcAChE approximately 100-fold stronger than DECA. These findings have several explanations: i) E2020 and BW are less flexible than DECA; ii) the aromatic groups of E2020 and BW form favourable π-π interactions with TcAChE aromatic residues, in contrast to DECA; and iii) and have aromatic groups and, therefore, occupy more volume and better fit the active-site gorge, than . Mutations at the mouse or chicken AChE residues, corresponding to the TcAChE (colored red), cause significant increase of inhibition constant values for all these 3 inhibitors, supporting the notion that these residues are critical for inhibitor-AChE binding   . is an untypical acetylcholinesterase inhibitor (1jjb). It consists of heptameric polyethylene glycol (PEG) with a thiol group (SH) at the terminus. The thiol group binds close to the and the second terminus binds to the . PEG-SH-350 interacts with Torpedo californica acetylcholinesterase via a system of (represented by oxygens colored red). Two out of the seven PEG-SH-350 ethylene glycol units are in trans (colored blue), while the others are in ±gauche . Aricept. Among the most interesting drugs that have been designed to inhibit acetylcholinesterase are those that have two binding sites that bind both the peripheral and catatylic sites simultaneously. Such drugs bind strongly and with high specificly. A good example is (1eve). It appears that the principal interaction between the aceylcholine and the enzyme is the relatively newly discovered cation-pi interaction between the cationic moiety of the substrate and the many aromatic residues lining the catalytic gorge. Unlike most interatomic interactions in chemistry, cation-pi interactions are unusual in that their energy hardly changes as the cationic and aromatic ring centers distance vary between 4 and 7 Å, and for a wide variety of relative orientations of the aromatic rings. This gives the substrate an energetically smooth ride down the gorge with few bumps or barriers to impede passage down the gorge. Most acetylcholinesterases have a net negative charge and a large patch of negative potential around the entrance to the active site gorge. This may be useful to attract the positively charged acetycholine substrate to the site. As one travels down the gorge, this potential becomes increasingly more and more negative, reaching a peak at the active site at the base. Because of this potential, the peripherial site is thought to act like a substrate trap, that forces practically every molecule of substrate that reaches the peripheral site to travel down the gorge to the active site. This probably contributes greatly to the extremely rapid rate of degrading the substrate. This whole enzyme therefore acts like a brilliantly designed natural vacuum cleaner that clears the neurotransmitter out of the synapse extremely quickly. Yet to be solved, however, is how the products clear the active site rapidly, whether back through the gorge, or out a back door on the other side of the protein that quickly opens each catalytic cycle (Trp84 is actually near the surface at the 'underside' of the protein). The X-ray structure of the E2020-TcAChE complex shows that E2020 has a along the active-site gorge, extending from the anionic subsite () of the active site, at the bottom, to the peripheral anionic site (), at the top, via aromatic stacking interactions with conserved aromatic acid residues. E2020 does not, however, interact directly with either the catalytic triad or the 'oxyanion hole' but only . Binding sites of Torpedo californica acetylcholinesterase (EC 3.1.1.7) with the bisquaternary ligand decamethonium (DME, 1acl). DME is oriented along the ; one quaternary group is apposed to the indole moiety of (catalytic anionic site, CAS) and the other to the indole moiety  of , near the top of the gorge, i.e. the "peripheral" anionic site (PAS). The only major conformational change in the structure of TcAChE is in the orientation of (purple) which lies parallel to the surface of the gorge, near the CAS of TcAChE which contains the S200, E327 & H440 (magenta) . This page was last modified 11:13, 30 May 2018. This page has been accessed 55,921 times. User-added text is available under Proteopedia:Terms of Service and the CC-BY-SA 3.0 License.